File contains outgoing and incoming correspondence regarding 1978 strike pay, a list of cheques released to signatories, and statements of earnings. Correspondence includes memoranda to Local 1's union office authorizing release of strike pay cheques to third parties. 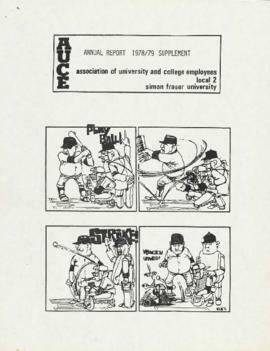 File also includes Local 2's Annual Report 1978/9 Supplement. Topics discussed include maternity benefits, strike action, negotiations with Simon Fraser University, and committee reports.